Before The Fiance, I had no idea what Yorkshire pudding was – it wasn’t something I grew up with, and I’d never encountered it before. While my family was big on roast Sunday lunches, they were always done on the Weber by my step-father, and meat was usually accompanied by more meat, and perhaps rice, gravy and salad. And the food that reminds me most of my granny? Curry with dumplings. Yup, her dumplings were the best, and I’ve never been able to get them right! Yorkshire Puddings are cooked once the meat you’re roasting is done, and you’ve taken it out of the roasting pan and the oven. I don’t know what you use to make gravy, but generally I use the oil/fat that has dripped from the roast while it’s cooking and has collected at the bottom of the pan – so I split the drippings into two jugs – one for using for Yorkshire Puds, and the other to make a delicious, thick gravy. About an hour before the meat is cooked through, sift the flour into a mixing bowl, add the milk and eggs and mix completely – the texture you’re going for here is pancake mix – because, well, Yorkshire Pudding mix is essentially pancake mix. Once completely lump-free, leave the mixture to stand for an hour. 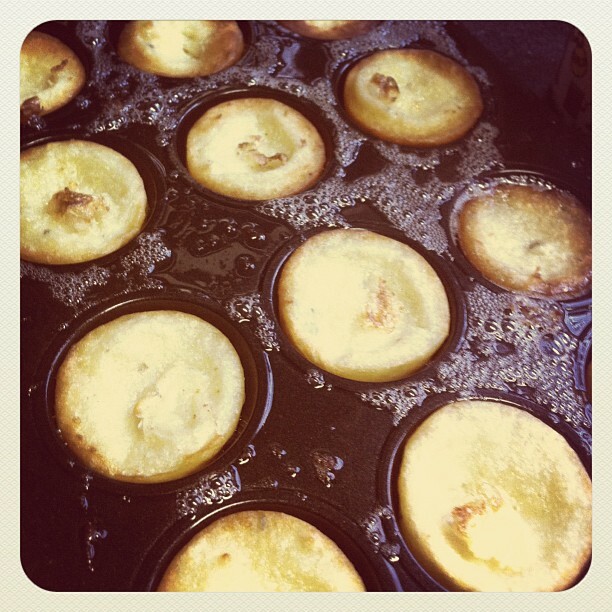 I made my Puds in a mini-muffin pan – so that they were perfectly bite-sized – but you could do it in a regular muffin pan, or in a flat pie dish as well, I’d imagine. Either way, you’re going to be greasing the cooking container well, so that the Puds can slide out easily when you’re done. Once you’ve greased the pans, pour about a millimeter of the drippings into the bottom of each cup in the tray, and then fill each cup about two-thirds of the way with Pud mixture – they will rise, so you have to give them some space. The oven needs to be on 220degrees Celsius – pop them in – and leave them for 14 minutes – DO NOT OPEN THE OVEN DOOR – check them through the window, or else they will sink in the middle. They’re ready when they’re starting to go golden brown on top. This entry was posted in family things, life things, love things and tagged cooking, foodie goodness, heart, inspiration, life in south africa, martha stewart should be ashamed of herself, recipes, taken with iPhone, wholesome, yummy. Bookmark the permalink. This is also not something I know of. First time I hear of them. Puddings are sweet but this sound savory? I use the Yorkshire Pudding recipe when I make Toad-in-a-hole! LUVVIT! Angel´s last blog post ..I’m Going To Be A Fashionista! Thanks a million! Going to try this over the weekend. I’ll let you know the verdict from the family. Cheers! Wenchy will even try this. I’ve moved to South Africa and would normally buy plain flour to make this recipe. What flour should I buy – there only seems to be cake or bread flour on sale?